Rahbarian, P., Salehi Sardoei, A. (2014). Effect Waste of Palm Trees and Sand and Perlite Mixed with Some Growth Indices Ficus benjamina. International Journal of Advanced Biological and Biomedical Research, 2(3), 573-578. Parviz Rahbarian; Ali Salehi Sardoei. "Effect Waste of Palm Trees and Sand and Perlite Mixed with Some Growth Indices Ficus benjamina". 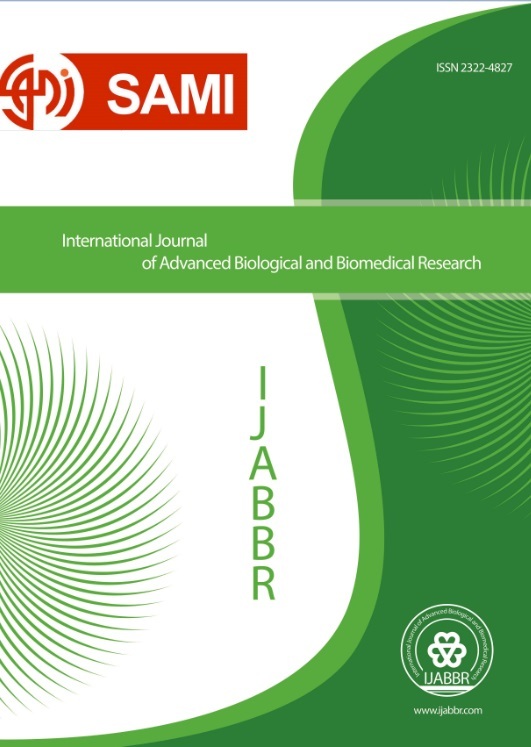 International Journal of Advanced Biological and Biomedical Research, 2, 3, 2014, 573-578. Rahbarian, P., Salehi Sardoei, A. (2014). 'Effect Waste of Palm Trees and Sand and Perlite Mixed with Some Growth Indices Ficus benjamina', International Journal of Advanced Biological and Biomedical Research, 2(3), pp. 573-578. Rahbarian, P., Salehi Sardoei, A. Effect Waste of Palm Trees and Sand and Perlite Mixed with Some Growth Indices Ficus benjamina. International Journal of Advanced Biological and Biomedical Research, 2014; 2(3): 573-578. An important factor in the growth medium of plants and chemical plants. native substrates can be used to improve plant performance. To evaluate the effect of growth medium on the herb F. benjamina experimental design was completely randomized with eight treatments and four replications were carried out in the research greenhouse of Islamic Azad University of Jiroft. F. benjamina plants from vegetative characteristics showed significant differences with each other. The maximum chlorophyll index and number of branches of palm peat substrates, respectively. The use of native substrates for growth was F. benjamina. Palm peat substrate, makes for a very low cost and have a very low ph features such as good water absorption, especially F. benjamina plant is used for all files. Abdolahi, Y., Yavarzade, M.R and Vakili, M.A. (2011). Effect of the Growing Media and Fe and Zn on the Growth and Essential Oil of Rosmarinus Officinalis L. in the Bam Region.j medicinal and spice plants research, 1(4): 19 – 9. Borji, H., Mohammadi Ghahsareh, A and Jafarpour, M. (2010). Effects of Date Palam and Cocopeat substr ates on yield and quality of tomato in soilless culture. Proceedings of the 5red National Conference on New Ideas in Agricultural Branch, Isfahan, Iran. Pp: 131. Burger, D.W. (1997). Composted green waste as a container medium amendment for the production of ornamental plants. HortScience, 32: 57 - 60. Hesami, A., Amini, F., Sarikhani, Q and Bir ghdar kashkol, A. (2010). use of Palm waste as an alternative to the Cocopeat hydroponic strawberry cultivation. Proceedings of the Second National Conference on Agriculture and Sustainable Development, pp: 1-4. Hematian Dehkordi., M. Mohamadi Ghahsareh, A and Kalbasi, M. (2010). Effect of palm peat and its mixtures with soil on yield and some growth index of hydroponically grown cucumber. Proceedings of the 5red National Conference on New Ideas in Agricultural Branch, Isfahan, Iran, Pp: 215. Higaki, T and imanmura, J.S. 1985. Performance of food products as media for culture of Anthuriums. College of Hawaii. Research series, pp: 40. Javanpour Heravi, R., Babalar, M., Mir Abdolbaghi, M and Askari, M. (2005). Effect of Hydroponic nutrient solution and substrate on quantitative and qualitative characteristics of tomato growing in greenhouse. Journal of Agricultural Sciences Iranian, 36 (4): 939-946. Khilighi, A and Padasht Dehkaee, M.N. (2000). Effect of media produced by tree bark, tea waste, rice hall and azolla as a substiiuta for peat, on growth and flowering of marigold (Tagetes patula cv.Golden Boy). Iranian J. Agric, Sci, 71(3): 557 – 565. KhoshKhui, M., Shybany, B., Rouhani, L and Tafazoli E. (2006). Principles of horticultural science. 14th printing. Shiraz University Press. Iran, pp: 594. Mashadi jahafarpour A, Henareh M. (2009). All substratesused in hydroponic culture. 1red National Congress of hydroponic sand green house production. Isfahan, Pp: 254. Noguera, P., Abad, M., Noguera, V., Puchades, R and Maquieira, A. (2000). Coconut coir waste, a new and viable ecologically friendly peat substitute. Acta Hort, 517: 279 - 286. Samiei., L, Khalighi, A., kafi, M and Samavat, S. (2004a). Peat Moss Substituting with Some Organic Wastes in Pothos (Epipremnum aureum golden pothos) growing media. Iranian Journal of Horticultural Sience and Technol ogy, 6 (2): 88 - 79. Samiei, L., Khalighi, A., kafi, M., Samavat, S and Arghavani, M. (2004b). An Investigation of Substitution of Peat Moss With Palm Tree Celluloid Wastes in Growing Aglaonema (Aglaonema Commutatum Cv. Silver Queen). Iranian, J. Agric. Sci, 36 (2): 510 – 503. Shabani, T., Peyvast, G.H and Olfati, J. (2011).Effect of different substrates on quantitative and qualitative traits of three pepper cultivars in soilless culture. J. Science and Technology of Greenhouse Culture, 2(6): 11 – 21. Verdonc, O and Gabriels, R.I. (1992). Reference method for the determination of physical properties of plant substrates. II. Reference method for the determination of chemical properties of plant substrates. Acta Hort, 302: 169 – 179.